The mountain was named in honor of a Colorado statesman, Samuel Hitt Elbert, who was active in the formative period of the state and Governor of the Territory of Colorado from 1873 to 1874. Henry W. Stuckle of the Hayden Survey was the first to record an ascent of the peak, in 1874. The easiest and most popular climbing routes are categorized as Class 1 to 2 or A+ in mountaineering parlance. Mount Elbert is therefore often referred to as the "gentle giant" that tops all others in the Rocky Mountains. 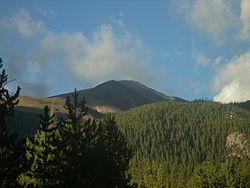 Mount Elbert is visible to the southwest of Leadville, often snow-capped even in the summer. Many other fourteeners surround Elbert in all directions, and it is very close to central Colorado's Collegiate Peaks. The neighboring Mount Massive, to the north, is the second-highest peak in the Rocky Mountains and the third-highest in the contiguous United States, and La Plata Peak, to the south, is the fifth-highest in the Rockies. The community of Twin Lakes lies at the base of Mount Elbert, Denver is about 130 miles (209 km) to the east, Vail is 50 miles (80 km) to the north, and Aspen is 40 miles (64 km) to the west. Leadville, about 16 miles (26 km) to the northeast, is the nearest large town. Elbert's parent peak is Mount Whitney in California. Including Alaska and Hawaii, Mount Elbert is the fourteenth-highest mountain in the United States. Mount Elbert is part of the Sawatch Range, an uplift of the Laramide Orogeny which separated from the Mosquito Range to the east around 28 million years ago. The tops of this range were heavily glaciated, leaving behind characteristic summit features and other such clues. For example, the base of Elbert on the eastern side exhibits large igneous and metamorphic rocks deposited when the glaciers receded, which lie on a lateral moraine. Further up the eastern side there is a large cirque with a small tarn. There are also lakes to both the north and south, Turquoise and Twin Lakes respectively; the Twin Lakes are a result of the natural dam of end moraines,  and Turquoise Lake was created by the manmade Sugar Loaf Dam. ^ a b c "MOUNT ELBERT". NGS data sheet. U.S. National Geodetic Survey. Retrieved December 30, 2015. ^ a b c d e "Mount Elbert, Colorado". Peakbagger.com. Retrieved December 30, 2015. ^ a b "Mount Elbert". Geographic Names Information System. United States Geological Survey. Retrieved November 14, 2014. ^ The elevation of Mount Elbert includes an adjustment of +1.995 m (+6.55 ft) from NGVD 29 to NAVD 88. ^ Cate Starmer (ed.). Colorado (9 ed.). Fodor's. p. 132. ISBN 978-1-4000-0415-7. ^ a b c "Mount Elbert". Summitpost Organization. Retrieved 14 May 2013. ^ Vetter 2011, p. 111. ^ Hopkins & Hopkins 2000, p. 107. ^ a b c d Hopkins & Hopkins 2000, p. 110. ^ a b Kelsey 2001, p. 956. ^ "Samuel Hitt Elbert". Colorado Governor's Index. Retrieved 4 September 2013. ^ a b c Enright 2009, p. 12. ^ "No tall tale: State higher than thought". Denverpost. Retrieved 4 September 2013. ^ a b Dziezynski 2012, p. 153. ^ Porter & Coulter 1874, pp. 2, 4, 64, 83, 111, 116, 128, 132–. ^ a b Holmes 1990. ^ Holmes 1990, p. 189. ^ a b "Mount Elbert Trails (Fourteener)". US Dept. Agriculture. Retrieved 13 May 2013. ^ Dziezynski 2012, p. 151. ^ Gaug 2011, p. 124. ^ a b Roach 1999, pp. 93–8. ^ Gallman 2006, p. 129. Dziezynski, James (7 August 2012). Best Summit Hikes in Colorado: An Opinionated Guide to 50+ Ascents of Classic and Little-Known Peaks from 8,144 to 14,433 Feet. Wilderness Press. ISBN 978-0-89997-713-3. Enright, Kelly (2009). America's Natural Places: Rocky Mountains and Great Plains. ABC-CLIO. ISBN 978-0-313-35315-4. Gallman, J. Matthew (15 March 2006). America's Joan of Arc : The Life of Anna Elizabeth Dickinson: The Life of Anna Elizabeth Dickinson. Oxford University Press. ISBN 978-0-19-803654-8. Gaug, Maryann (17 May 2011). Hiking Colorado, 3rd. Globe Pequot. ISBN 978-0-7627-6880-6. Helman, Adam (2005). The Finest Peaks - Prominence and Other Mountain Measures. Trafford Publishing. ISBN 978-1-4120-5995-4. Holmes, Don W. (1990). Highpoints of the United States. Cordillera Press. ISBN 978-0-917895-33-3. Hopkins, Ralph Lee; Hopkins, Lindy Birkel (2000). Hiking Colorado's Geology. The Mountaineers Books. ISBN 978-1-59485-307-4. Kelsey, Michael R. (2001). Climber's and Hiker's Guide to the World's Mountains and Volcanos (4th ed.). Provo, Utah: Kelsey Publishing. ISBN 978-0-944510-18-6. Porter, Thomas Conrad; Coulter, John Merle (1874). Synopsis of the Flora of Colorado (Public domain ed.). U.S. Government Printing Office. Roach, Gerry (1 April 1999). Colorado's Fourteeners: From Hikes to Climbs (2 ed.). Fulcrum Publishing. ISBN 978-1-55591-412-7. Vetter, Jeremy (2011). Knowing Global Environments: New Historical Perspectives on the Field Sciences. Rutgers University Press. ISBN 978-0-8135-4875-3. Retrieved 16 May 2013. "Trip report from Mount Elbert". HikinginTheRockies.com. "Mount Elbert (Photo Essay)". hikingincolorado.org. "Mount Elbert". Peakery.com. Archived from the original on 2011-09-19. "Mt. Elbert - Main route via North Elbert Trailhead". RockyMountainHikingTrails.com.